Our city-wide Independence Day campaign kicked off before the 4th of July. The project originated in partnership with the Myrtle Avenue BID, whose visionary leadership invites creative ideas and advocates for social justice every day. Why did we do all of this? Given the diversity in our neighborhood and the activism of so many of our colleagues, we thought a single message and visual could unify the business community to show our support for each other and our neighborhoods. The timing worked out so that we could launch this holiday weekend and we thought it was a perfect chance to reclaim patriotism with a positive message. With the help of Adam Snetman, one of our favorite designers, we developed a poster and flyer campaign for businesses of Myrtle Avenue and were delighted when it was adopted by 21 other BIDs across Brooklyn, Queens and Manhattan. The flyers were translated into 9 languages. We also made a little Hate Has No Business Here website where you can download the flyer to put up in your window. 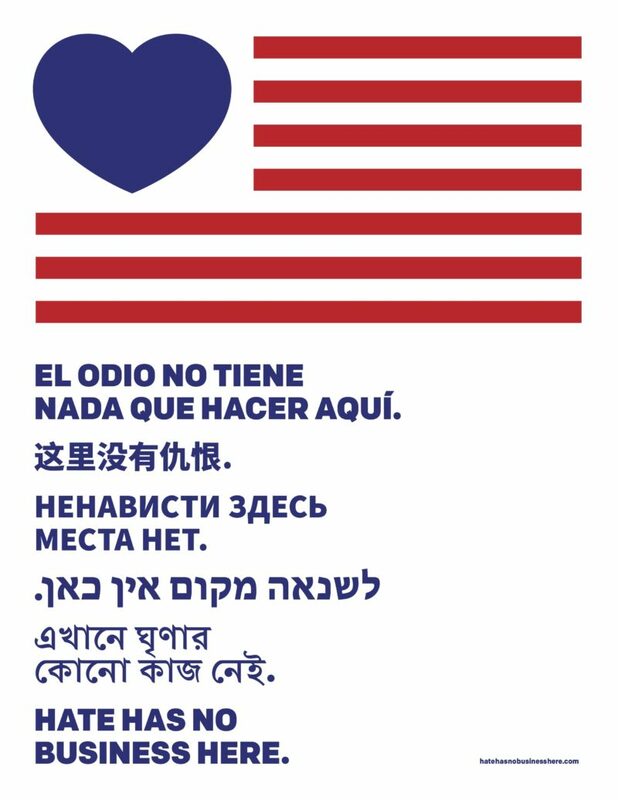 If you spot a poster, flyer or decal, post it with the hashtag #nohatehere so we can see the solidarity in other neighborhoods. Read more about the campaign in these great write ups: The NY Times, BKLYNER, Brooklyn News Channel 12 and TimeOut.